Santa Claus Vs the Ice Demons by Ablach Blackrat is another Game Maker winter's contest entry. 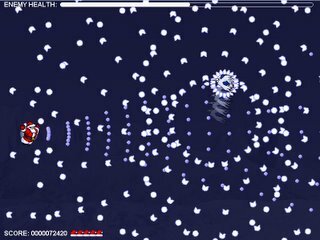 This one's a danmaku game. I found it pretty easy until level 7, then increasingly difficult. Use Z to shoot and X to move slowly for more accurate movement. Your belt buckle is your hit-target. It's not too special compared to the better games in the danmaku genre, and is pretty rough in a lot of places, but it's sometimes fun to have a nice warm cup of danmaku now and then in the cold winter months. I recommend that you turn effects off if you have a slow computer, it really helped the frame rate for me.